Hi folks, are you an Android lover and also want to enjoy the music with the Podcast Apps? Then, you are in the right place. Let’s look at the some of the Podcast apps for your Android Phone. There are many ways by which you can make your Smartphone- ‘a productive tool’. But the best way is Listening to Podcast to make your phone productive- not only to get deep knowledge about something and to explore new ones. I also got hooked up with Podcast and tried a number of apps which are available on Google Play Store. You can also browse and download the app from Google Play Store but it would be very confusing for all of us to choose the best one. So, in this write, I have come up with a List of some Apps from which you can choose the best one for yourself. It one of the best paid Podcast apps that you can find on the Play Store. But it won’t be regret to pay for this app because of the features that are offered by it. 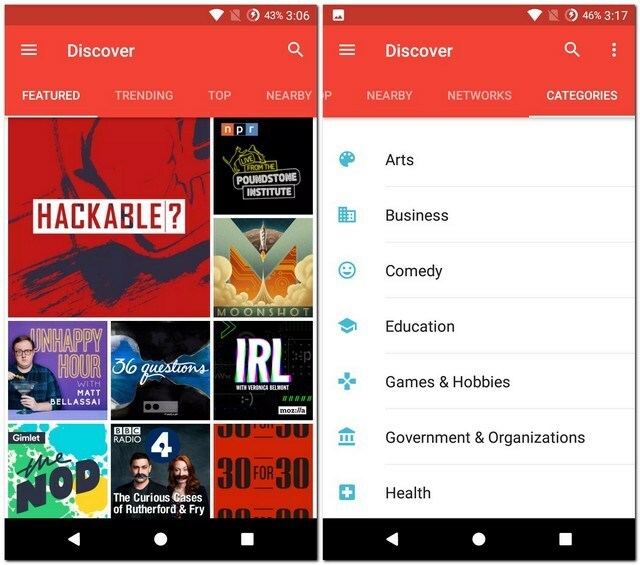 When we open the app, we will find featured podcasts, but the Categories tab would be very useful to you as you can find the Podcasts sorted according to their categories like business, art, comedy etc. Another Network tab helps you to find a particular station; if you are fond of some station, this will show you all the channels of that station in a single place. Being a free app with almost all features makes this app to be considered in one the best free Podcast apps. You can search from a ton of podcasts and also add a live radio station that is offered in many languages like English and Spanish etc. if you are having any audio books this app allows to import that and play directly from there which makes this very convenient to listen to an audio file from a single place. The offers a Discover tab in which channels categorized on the basis of trending, new, top audio and top video. 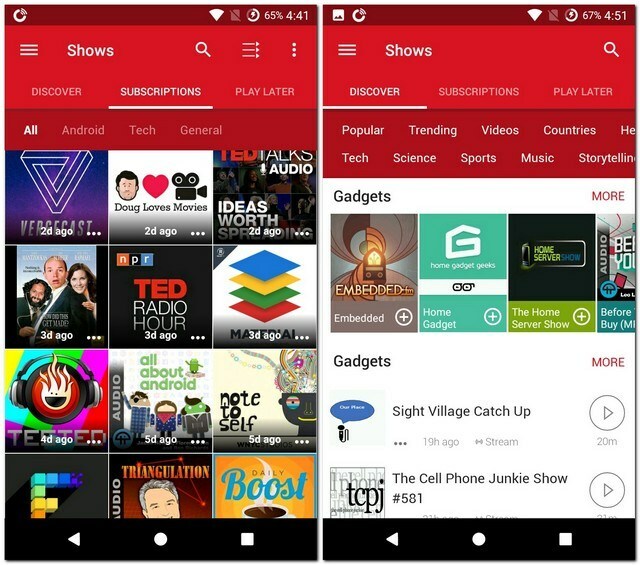 Other tabs that are offered by this app are Browse Podcast Network where you can find the most popular channels and Podcasts suggestions that suggest you the Podcasts on the basis of your listening habits. It is another popular Podcast app that allows you to search not only for keywords in podcasts but also in stations and episodes. This app also allows searching for top charts, play audio books and many more. Podcasts Republic also features radio stations that can be added searched or added by URL. Now you can listen to your favorite podcasts in offline mode as this apps allows you to download the Podcasts. You also don’t have to worry about e apps losing it as it gives us the facility of doing Backup of download Podcasts in the internal storage of your phone. This app also comes with car mode which comes handy while driving. This app takes you through an amazing journey of different Podcasts. When you open the app you may ask to choose different topics like Android, money, cars etc. The next screen asks you to configure auto-downloading. You can choose either on Wi-Fi or manually. When you are done the initial setup of an app, it may take a while for the feed to get updated. Other than this you can explore further. 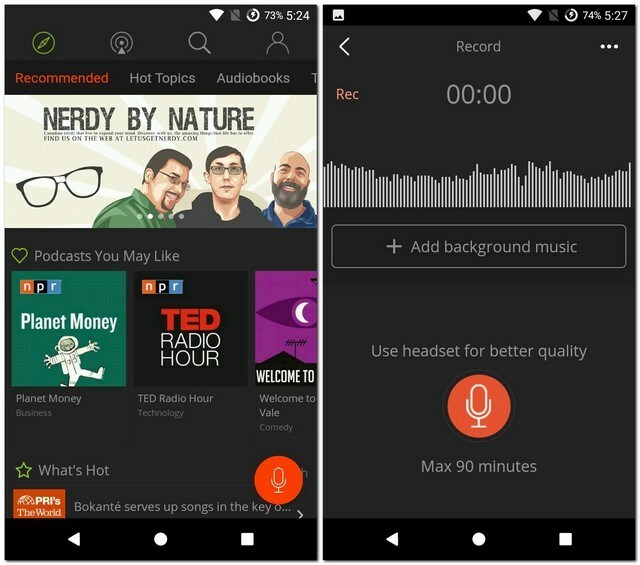 You can find more Podcasts by using built-in dynamic search and use common features of most of the apps like playlist management, backup and restore etc. For the customization, this apps comes with two themes-Light and Dark. 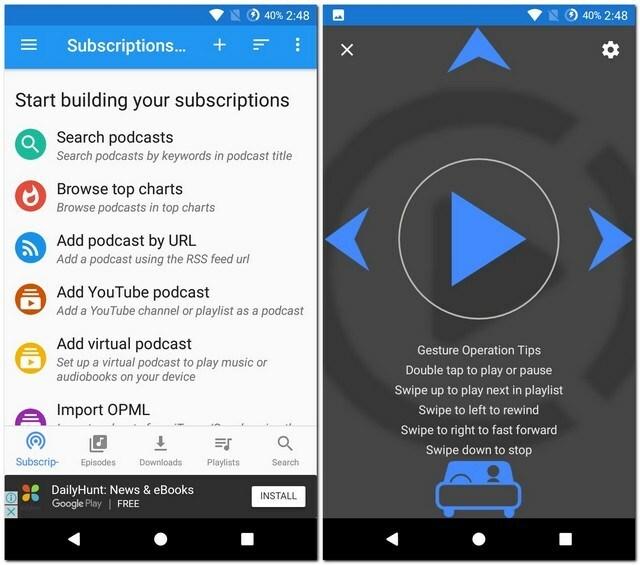 This app is the best way to kick-start your Podcast listening experience by selecting the topics you are interested in. By default, podcasts are set for auto-downloading. If you want to change your app settings you change it any time. You can search Podcasts based on topics and filters like popular and trending. If you like a podcasts description but don’t have time to listen to it you can mark it as Play Later. Further, you can define headphone actions. To make an app more interesting you can choose from different types of themes like-Classic, Dark and Black. Overall the Podcast Player is a good free app for Android. This is the simple but an efficient app for android. When you will download the app you will see that few popular feeds displays on the Home Screen. The channels of Podcasts are sorted as top, network, and categories. Like most of the apps, Network tab shows the popular Podcasts stations. Similarly, Categories tab helps to find the Podcasts by categorizing them as business, comedy etc. There is another tab named Recommendation, in the starting, you will not see anything but after subscribing to some channels you will see similar channels here. Unlike other apps, this app doesn’t show search on top of the screen instead it shows subscribe. If this is not a problem for you then this app will not be a disappointment for you. For using this app you have to first sign-in. On the main screen, you will find the recommended Podcasts, audio books and top 100. If you are looking for a particular Podcasts you can find that in the app. Similar to other apps, you can set up Auto-downloading of new episodes over Wi-Fi. The best part of this app is that it allows you to upload the Podcasts. For unlimited uploads, you have to do an in-app purchase. If you don’t want to do so, you can still upload Podcasts but in limited number. I hope these apps make your life easier to enjoy the unlimited music. Keep watching this space to get the latest Podcast apps for Android smartphone.